10. Trolling with umbrella rigs. Like to use this technique trolling in deeper parts of Narragansett Bay, off Newport or Block Island with a variety of squid, shad, worm or eel umbrella rigs. Hook two or three fish at the same time and you are in for a very memorable ride. 9. Casting plastic shad swim baits. Many anglers love this technique and use it most often with success in the spring. 8. Buck tail jigs with pork rind squid strips. Have had success with this method to get under schools of blue fish to get at the striped bass on the bottom. 7. Live eels. Used by shore or boat anglers, some fishing guides use this as their primary method to catch killer stripers. Hook the eel through the mouth and out an eye. Going between the eyes usually kills the bait. 6. Live menhaden. Snag the live bait with a weighted treble hook. Hook the bait through the bridge of the nose, find the pod of fish again and put the live menhaden back into the pod of bait and let it swim. Used when menhaden are running strong, particularly up the Providence River in early spring. 5. Chucking fresh or frozen menhaden. Can anchor or fish moving bait pods with chunks. Can chum with chucks and pieces too. Some anglers use a weight slider to get the bait down to the striped bass. 4. Surface plugs. Have caught hundreds of school bass in the spring using surface plugs of all types. 3. Swimming lures. Great way to catch fish in coves, on rivers, etc. My friend Jim swears by Yo-Zuri Crystal Minnows. 2. Parachute squid jigs. Often used in ocean water (where there are squid). Anglers successfully use this method off Newport and Block Island. 1. Trolling with tube and worm. I have had great success using lead line on the Bay with red tubes. Hugely successful on the Southwest ledge off Block Island with 300 ft. of wire line out in 40 to 50 feet of water and using amber tubes. There are other ways to catch striped bass. So e-mail me your favorite method(s) and we will share it with others. The Rhode Island Department of Environmental Management (DEM) has proposed amendments to Marine Fisheries Regulations (both recreational and commercial) for several salt water species at a public hearing on Wednesday, April 22 at the URI Bay Campus. For a complete list of proposed regulation changes visit DEM’s Fish & Wildlife Web site at www.dem.ri.gov./progrmas/bnatres/fishwild/ . At the meeting, DEM related a change in recreational summer flounder regulations necessary to properly manage the fishery. With input from fishermen and the industry, DEM’s Fish and Wildlife Division developed six different summer flounder recreational fishing regulation change options. Option four was the most popular option at the meeting. The proposed regulation increased the size to 21” (from 20”), reduced the per person per day bag limit from seven to six, and reduced the recreational fishing season for summer flounder from year round to June 13 through December 31. Richard Hittinger, board member of the Rhode Island Salt Water Anglers Association and a recreational representative to the Rhode Island Marine Fisheries Council said regulations are a balance between the season, size and bag limits. “Each of the options presented had pluses and minuses, but option four seemed to make the most sense”. Acting Marine & Wildlife director Mark Gibson related that DEM director, W. Michael Sullivan, will review the proposed change options, public comments and will develop recommendations. The Rhode Island Marine Fisheries Council will then vote on recommended changes. My guess is that the approved changes will not be in effect before the summer flounder start to bite. But keep your eyes and ears open because regulations will likely change as the season progresses. Striped bass. A lot of bait fish around the mouth of the Barrington River and at Rumstick Point, however no stripers. Ken Ferrara from Ray’s Bait & Tackle related customers caught fish using frozen herring chucks at Mill Cove near Conimicut Point. Angler Mike Shepard from Newport reports no striped bass around this weekend. Craig Mancini from Continental Bait & Tackle in Cranston said school stripers are being reported in and around the mouth of Narrow River. Dave Henault of Ocean State Tackle (Coventry/Providence/Bristol) reported Bob Oberg continues to catch stripers (31 this week) trolling in this kayak with tube and worm on the Thames River in CT. I fished Green River, Greenwich Bay and Greenwich Cove with no luck this past weekend. The water is warming up, bait is more visible so conditions are right for striped bass to start appearing soon. Tautog action slow this past week in the Bay and off Newport. Gary Leatherberry of Erickson’s Bait & Tackle in Warwick related that when the apple blossoms appear the tautog appear too, so tautog should be here soon. Fluke. No fluke bite reported. See proposed DEM regulation changes above. Fresh water bite still good. Anglers still catching fish at a variety of ponds, again not their limit but some nice fish. A lot of largemouth bass were taken this weekend at Meshanicut Lake reports Craig Mancini of Continental Bait & Tackle. 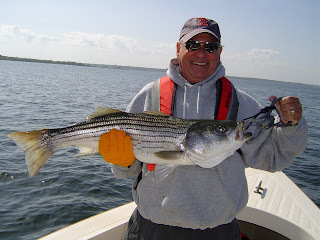 Captain Dave Monti has been fishing and shell fishing on Narragansett Bay for over 40 years. He holds a captain’s master license. Your fishing photos with captions, stories, comments and questions are welcome… there’s more than one way to catch a fish so e-mail Captain Dave at ­­­dmontifish@verizon.net . Eric Appolonia of North Kingstown and I caught monster striped bass this fall using wire line and amber colored tube and worm on Block Island’s Southwest ledge. The largest fish that day was 46” and 40 lbs. Angler Jim Malachowski of Cranston displays a 36” striped bass caught last spring using live menhaden on the Providence River. As we prepared the boat to take the children fishing you could hardly see the end of the dock. The fog engulfed the boat as we motored up Greenwich Cove as if it was protecting us. Just as the 250 children and over 60 vessels that participated in the fishing event would be protected throughout the day. It was the Rhode Island Saltwater Anglers Association’s (RISAA) 12th Annual “Take-a-Kid Fishing Day” that took place Saturday, June 20 at Brewers Greenwich Bay Marina in Warwick at the mouth of Apponaug Cove. The event was a huge success. RISAA member vessels from around the state, travelled in severe fog to participate in the event. Captain Robb Roach of Kettlebottom Outfitters, Jamestown, on his boat “Stella”, said “It took forty- five minutes to get to Brewers Marina”. The trip form Jamestown normally takes twenty to twenty-five minutes without the fog. I asked how many children would be on his boat. Robb related, “I want to take as many as they give me, my boat is large enough to handle quite a few.” He ended up with eight children in addition to chaperones and mates to assist him. This sprit from RISAA members set the tone for the day. A day of giving, shared by the children, the captains, the mates and over 200 volunteers that worked the logistics, the docks, the water and the barbeque grills. A fine lunch was provided for all participants and volunteers after the event. The purpose of the event is to give seven to thirteen year old children a chance to ride on a boat in saltwater and to experience the thrill of catching a fish. Many fish were caught, mostly small blue fish, however, a few children had the experience of catching their first striped bass. Several keeper bass over 28” were caught. For safety, fishing was restricted to Greenwich Bay. Vessels fished the Sally Rock area, the west side along Chepiwanoxet and the north side of Greenwich Bay along Buttonwoods. The Rhode Island Lions Sight Foundation will sponsor a fishing tournament for the blind and visually impaired on Sunday, June 28 from 8 a.m. to 12 noon on one of the party fishing boats of the Frances Fleet in Galilee, Rhode Island. The tournament will be followed by a buffet lunch at Casey’s Restaurant in Wakefield. The excitement of catching a fish is the same for the visually impaired. Even though they can’t see the fish they touch and feel them. For many participating in this tournament it is the first time they have fished. Contact Jay Ward at 401.699.7009 for additional information. Fresh Water. Fresh water fishing was good this week. Action continues to heat up. Craig Mancini from Continental Bait & Tackle said largemouth bass are biting and the trout have joined the action too. Shiners continue to be the number one choice bait for largemouth bass. Trout worms and rainbow trout power baits are keeping the trout bite on. Striped bass fishing continues to be lively in the Bay, along the ocean coast and out on Block Island. Artie Peltier of Erickson’s Bait & Tackle, Warwick related that he has been catching small bass in Greenwich Bay throughout the week using soft plastics and at the end of the week he caught a 38” striped bass on light tackle. Craig Mancini from Continental Bait & Tackle, Cranston said the break wall off Narragansett Parkway continues to produce keeper sized bass. One customer pulled in 25 to 35 pound fish. A customer said the area near Fox point, the Washington Bridge and the river all the way up to Pawtucket has been producing monster sized cows off live and frozen menhaden. Fluke (Summer flounder) season opened June 17th and the fishing has been great. Don Smith fished between Deep Hole and Carpenters Beach in 38 to 40 fee of water and caught his limit including a 9.7 lb fish. Fishing off Matunuck Beach has been good too in 35 to 40 feet of water. I caught one keeper out of four fish at Austin Hollow in seventy-five minutes. Once the tide changed to an outgoing tide making the current and wind move in opposition direction, the bite was off. I tried to move the boat slowly with the engine but could not get them to bite again. Caption Dave Monti has been fishing and shell fishing on Narragansett Bay for over 40 years. He holds a captain’s master license and a charter fishing license. Your fishing stories, comments and questions are welcome… there’s more than one way to catch a fish so e-mail Captain Dave at ­­­dmontifish@verizon.net . Juan (left) and Alberto (right) of Boy Scout Troop 7, Central Falls, RI fished my boat Angel Light during the RISAA Take-a-Kid Fishing Day. Alberto caught this striped bass off Sally Rock. From left to right: the crew on Angel Light, Captain Dave Monti of Warwick, Alberto and Juan of Central Falls and Peter Sousa of Warwick, who served as mate . 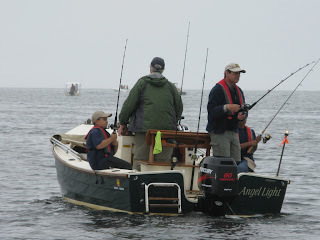 Angel Light crew fishing in a lifting fog Saturday during the Rhode Island Saltwater Anglers Association Take-a-Kid Fishing Day. Summer flounder or fluke is a great fish to catch and eat. They can be caught from a boat (usually while drifting) or from shore with little knowledge, so they are an ideal catch for beginners and children. This year the fluke season starts June 17 in Rhode Island and runs through December. To keep a fluke it must be at least 21” and the catch limit is six fish per person per day. Use these fluke facts and strategies to enhance your catch and keeper ratio. In May, fluke move in shore from deep Continental Shelf waters where they spend the winter. They stay inland until October and then move back to the deep water. They are a flat fish with two eyes on the same side of the fish. They are bottom fish that do not look aggressive, but they will chase bait aggressively and eat the same bait that blue fish and striped bass eat. The difference is that they eat off the bottom. I have caught several blue fish, particularly when retrieving my fluke bait rig as I brought it up through the water column. Last year, on a light tackle fluke rig, my brother-in- law hit a monster blue fish that nearly pulled both of us overboard. A rubber squid with a wide gap hook, color beads and a spinner blade is my favorite bait. I have found florescent green to work best. This bait has a float inside so the bait hangs just off the bottom and it attracts a lot of attention as it has to, because it is fished on the bottom, where the fluke are, where it is often dark. I spice-up the artificial bait with what I call a Captain Dave’s fluke cocktail. This consists of a previously frozen minnow or silver side (ideally the size of a finger) placed on the hook horizontally so it would appear to be swimming horizontally when on the bottom. (This tactic was taught to me by Gary Leatherberry of Ericson’s Bait & Tackle of Warwick a couple of years ago). This simple change in bait position has doubled my keeper ratio. Next, I place a three to four inch squid strip on the hook and top it off with a three to four inch strip of fluke belly (the white skin of the fish). This completes the fluke cocktail. Be careful not to stack so much bait on the hook that the fluke cannot bite it. One may ask where you get fluke bellies. Next time you clean your catch, cut the left over fluke belly into strips and freeze them in zip lock freezer bags along with a bit of salt water. Fresh fluke bellies would be ideal, but frozen ones can get you going until you catch a fish that can be used for this purpose. Water movement or bait movement is essential to catch fluke because they often stay in the same place for a while and you have to go to them. From shore, bait should be slowly dragged across the ocean floor (so rocky areas are out of the question for shore and boat fishing). From a boat the wind and/or current will move the boat and bait on the bottom. If slack tide or no current/wind, boat movement created by starting the engine can enhance your odds. Slowly put the boat in and out of gear to create movement. A good tactic is to move the boat in a circle; this slows the bait movement and allows you to cover a favorite area or hot spot over and over. So when you get a bite on a drift, you should mark the spot and recreate the exact drift line again. Because remember, the fluke are often stationary and you want to go back to where they are if you are getting hits. Sometimes there is too much wind, current or boat movement and your bait is not holding bottom and you are blowing by the fish. In this case shore and boat anglers should increase the sinker weight until you can keep the bait on the bottom. Often times, boat anglers employ underwater parachutes that fill with water to slow the boat speed (these can be found at local boating/fishing /bait & tackle shops). When you feel a bite wait and let the fluke eat the bait, if you jerk the rod to set the hook you may pull the bait out of the fluke’s mouth. So after you feel the fluke bite and then the line tightens, move the rod upward to set the hook and start reeling in, keeping the pressure on the fish as the fluke will try to shake the hook loose. Striped bass continue to be plentiful in the Bay. The East Bay area from Bristol Harbor to Providence is hot with a few fish in the 40” range and fish in the 30’s fairly common. Dave Henault of Ocean State Tackle, Bristol/Coventry/Providence, said customers were catching fish by live lining menhaden and chunking with menhaden, with eels and with tube & worm. Dave related customer Mary Sokolowski of Providence caught her first salt water fish (a keeper striped bass) last Tuesday. Ray Ferrara of Ray’s Bait & Tackle Warwick weighed several customers’ fish in the 40” range this week. I had the privilege of taking publisher John Howell fishing this week and he caught a 41” striper on the shipping channel bank just off Poppasquash Point. Craig Mancini of Continental Bait & Tackle reports that customers continue to land big fish off Gaspee Point. Mike Shepard reported that his son Ian caught a 25 lb. bass off Breton Reef. Mike related that the fishing off Newport is now fantastic with a lot of bait in the water. Surf fishing is still one day on and one day off on Aquidneck Island. Big bass are also being caught on Block Island. David Appolonia and his friend Brian Hogan caught a 48”/42 pound striped bass this past week on the Southwest Ledge, other big fish were caught during the outing too. Fluke (or Summer Flounder) season starts next week, June 17, 21” minimum size, six fish per person per day. Fluke (or summer flounder) season started June 17, so here are a few tips that have worked for me. Last week’s column featured Captain Dave’s fluke cocktail recipe… a fluorescent green plastic squid rig, baited with a horizontally hooked minnow, a squid strip and topped off with a strip of fluke belly. This arrangement doubled my keeper ratio. Something about that horizontally hooked minnow or silverside that attracts the big ones. When fishing alone I like to deploy two lines. A rod and reel with the above bait arrangement placed in a rod holder. Then I rig a buck tail jig with a piece of pork rind, squid or fluke belly and jig off the bottom. Slowly raise the rod a couple of feet and then let the jig drop to the bottom keeping no slack in the line. The hit will usually come as the jig floats down. Another tactic that will enhance your fluke bite is teaser baits placed a foot above the main bait with a foot long leader. Attach the teaser leader to the main line with a small three way swivel. The idea is to create action above the main bait that draws the attention of a fluke on the bottom. I often use a buck tail hook and attach a piece of pork rind or squid stip. The top hook often gets the hit. Fluke like live baits and feed during a moving tide when the bait is moving. Fishing in a wind that is blowing against the current or tide can slow your vessel, creating little bait movement which results in no fish. The idea is to plan your fluke fishing trips with current, tide and wind in mind. Select prime fluke fishing spots that will keep your vessel moving depending on these variables. Fluke like deeper water in the spring and early summer then move to more shallow water. My favorite fluking spots include the wall off Allen’s Harbor, Warwick Neck light, in front of Charlestown beach (just watch for the charter boats), off URI’s Bay Campus in Narragansett, off Beavertail’s west side and Austin’s Hollow off Jamestown. The season runs from June 17 to December 31, minimum size is 21” and with a catch limit of six fish/person /day. Proposed annual fees are $7.00 for residents, $10.00 for non-residents and a seven day resident or non-resident license for $5.00. Passengers on party or charter boats are exempt from the license law. Will keep you posted when this becomes law. 2009 Atlantic Bluefin Tuna Quota Specifications. The Rhode Island Party and Charter Boat Association reports that NOAA has published a final rule to establish 2009 fishing year specifications for the Atlantic bluefin tuna. The final rule sets a recreational daily vessel trip catch limit of one school bluefin tuna (27 to 47 inches), plus one large school/small medium bluefin (47 to 73 inches). NOAA originally proposed a daily limit of one fish for the season then raised the limit after analyzing rebuilding program guidelines. Coast Guard to Maintain Loran-C Navigation System. A bill recently introduced in the U.S. Senate (S.1194) will authorize appropriations to the Coast Guard to operate the LORAN-C system. Funds are allocated for the transition to eLORAN and to modernize and upgrade the LORAN infrastructure to provide eLORAN services. The bill proposes that $37,000,000 for each of fiscal years 2010 and 2011 be allocated for this purpose. Take-a-Kid Fishing Day is this Saturday, June 20 from 9:00 a.m. to 12 noon. Rhode Island Saltwater Anglers Association members will be fishing in Greenwich Bay with children on board. Anglers will start and finish at Brewer’s Greenwich Bay Marina in Warwick at the mouth of Apponaug Cove. Freshwater bite is still good. Last week Harold Hemberger reported landing twenty largemouth bass fishing at both Waterman’s Lake and Stump Pond in Smithfield. Stump Pond bass have uncharacteristically been hitting deep, on deep runners like Rebels and Rat-L-Traps. Striped bass. 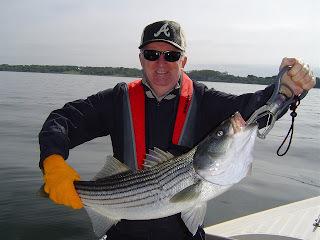 Ken Ferrara of Ray’s Bait & Tackle, Warwick, reported good striped bass fishing just outside and inside Apponaug Cove. The striped bass (and bluefish) bite has been aggressive at Narragansett using surface plugs says Harold Hemberger of Smithfield. Mike Shepard of Newport reports fish are still on Brenton Reef but have thinned out. Dave Henault of Ocean State Tackle, Bristol/Coventry/Providence, reports good striped bass fishing at the mouth of Narrow River using wooden plugs (last Friday a 34 inch bass was caught). Dave reported a 54 pound bass caught in the Cape Cod Canal. The bass are feeding on mackerel, menhaden and sea herring that are migrating through the Canal. Josh Powder has been fly fishing for bass in Greenwich Cove the past two weeks and has caught five keepers and forty-two fish. Fluke season started June 17, 21” minimum size, six fish/person/day bag limit. Father’s Day tribute. Hats off to Ben Cassese (12 years old) who took his Dad (John) fishing this week as a Father’s Day gift. Fishing affords fathers, sons and daughters quality time together and is a wonderful family learning experience. I would be remiss if I didn’t pay tribute to my own father, Gaetano Monti, for showing me the beauty of the ocean. Some of my fondest memories were spend with my Dad on our boat, the MaryLou. Father’s Day fishing trip. Fishing is a great way for fathers, sons and daughters to spend time together. Ben Cassese (right) took his dad John Cassese (left) fishing as a Father’s Day gift. Ben caught this striped bass at the mouth of Bristol Harbor. David Appolonia, South Kingstown (left) and Brain Hogan, Portsmouth (right) caught these striped bass off Block Island’s Southwest Ledge. The largest fish was 48”and weighted 42 lbs. Striped bass are migratory. They travel back to Rhode Island each spring. Just like some of our friends who use to live here. So here is a little history and a few facts about striped bass to help us understand why they are so highly regarded and why they keep coming back to Rhode Island. Like old friends. The bass travel up the east coast. In the spring and summer they leave their spawning grounds in the Chesapeake Bay, Delaware River and Hudson River areas and migrate north to Rhode Island and some as far north as the Canada. In the fall they migrate back and winter in the mouth of the Hudson River and the New Jersey coast in the Delaware and Chesapeake Bays. Old habits are hard to break. I think the bass like the food here in Rhode Island (herring, menhaden and squid) just like old friends like the food in Rhode Island (the great restaurants in Providence, Newport and the calamari on Federal Hill). Here are my top ten favorite facts about striped bass and their history (some facts courtesy of the Massachusetts Division of Marine Fisheries). 2. Striped bass tolerate both salt and fresh water. They live in the ocean but spawn up rivers. 4. Striped bass were the subject of our first conservation laws… in 1639 Massachusetts forbade the use of the fish for fertilizer, in the 1660’s they were the focus of our first environmental impact statement and passage of the Natural Environmental Policy Act. 5. Females grow larger than males. Most bass over fifteen pounds are female and can produce a million eggs for each ten pounds of weight. So rather than keeping the big fish, release them to help preserve the fishery. 6. In 1879 striped bass were taken from New Jersey and transported by train in wooden barrels and milk cans across the country to San Francisco Bay which was one of our country’s first fish stocking efforts. 7. In the late 1940’s and early 1950’s it was discovered that striped bass could and were flourishing and reproducing in fresh water lakes… so started the practice of stocking striped bass in large lakes around the country which is still going on today. 8. A fish 30” can weigh 11 to 16 pounds and be 8 to 14 years old. A 40” fish can weigh 24 to 35 pounds and be 13 to 25 years old (range in weight and age largely due to an individual fish’s luck in finding food). 9. A fish scale can reveal the age of a fish similar to the rings of a tree. Fish scales get larger as the fish grows by adding growth circles to the outside edge. Count the rings to determine the age of the fish. 10. Striped bass peak feeding times are the hour before sunrise and at dusk and they don’t have eyelids so they retreat to the deeper water when the sun comes up to avoid bright light. I want to thank my friends Ed Langon from California and John Graydon from New Jersey (both formerly of Warwick) for coming back to Rhode Island to visit family and friends this past week. 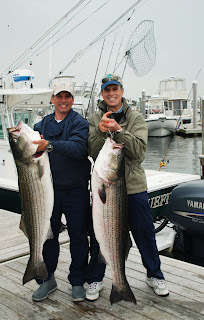 Both returned to Narragansett Bay and caught big striped bass on my boat. Also want to say hello to two sailboat captains and their mates I met this week while we cleaned our catch off Godard Park Sunday, the type of spontaneous friendships that boating and fishing spawn. Fresh water. Harold Hemberger reported a great night of fishing on Stump Pond in Smithfield this past week. He broke out his Rattle-Traps lures and the bass seemed interested in the noise making lures. The total for the night was six bass and three pickerel. Scup fishing has been good at the Stone Bridge, Jamestown and Newport. They are being caught on sandworms, clam tongues, calm necks and squid reports Dave Henault of Ocean State Tackle, Bristol/Coventry/Providence. Striped bass fishing was outstanding on the Bay again this week. Action was hot early in the week on the Providence River with good sized pods of menhaden. Angler Jim Malachowski of Cranston caught four nice fish ranging from 29” to 35” early in the week live lining snagged menhaden. The trick was to get there early just before sunrise and before boat traffic breaks up the pods of bait. Saturday over woo boats were fishing the Providence River. Anglers found it difficult to find and snag bait due to too many boats and not enough bait. The East Passage around Poppasquash Point and Bear Point, Prudence Island continue to bear fruit as well as areas around Conimicut Point. Sunday we caught eight keeper fish in two hours using tube and worm. Ken Ferrara of Ray’s Bait & Tackle, Warwick reported big fish (as large as 46”) being caught of Agawam Cliffs and around the Jamestown Bridge. Ken related that fish are usually caught in these areas in the summer not the spring. Mike Sheppard of Newport reports a slow start to the season on Aquidneck Island compared to action in the upper Bay. However, fishing has improved along beeches. The Uncle Jimmy Strip Bass Tournament was hosted at the Harborside in East Greenwich this weekend. In a field of roughly 100 anglers Kyle Armstrong took first place with a 24 pound bass caught live lining a menhaden in the Providence River. Second place went to Ray Masciarelli Jr., he landed a 23 pound fish. Proceeds for the tournament went to the Rhode Island Food Bank reports Dave Henault from Ocean State Tackle. Captain Dave Monti has been fishing and shell fishing on Narragansett Bay for over 40 years. He holds a captain’s master license and a charter fishing license. Your fishing photos with captions, stories, comments and questions are welcome… there’s more than one way to catch a fish so e-mail Captain Dave at ­­­dmontifish@verizon.net . 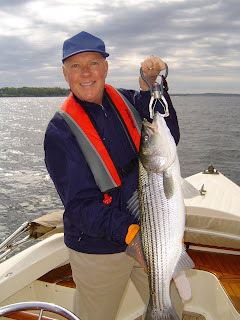 Ed Langon (former Warwick resident) catches a big striped bass of Bear Point, Prudence Island. Ed came back to Rhode Island from California to visit family and friends. John Graydon (former Warwick resident) landed this 35” striped bass off Poppasquash Point. John and his wife returned to Rhode Island to visit his mother-in-law and friends last week. He lives in New Jersey now. My father-in-law Horace Magnan was a music educator and band leader. He had a saying my wife likes to repeat… it’s not always about the music. Over the years my wife sang and helped manage the band. When things got hectic my father-in-law would tell her to relax… take it easy… it’s not always about the music. It just as much about the people … the friendship of guys in the band, the love for the people you play for, etc. So, as a fisherman, I have adopted this saying… it’s not always about the fish. Just as important are the lessons we learn from fishing… discipline, creativity, self reliance, environmental awareness and conservation. And, the most important fishing lesson is obtained through the relationships developed while fishing. To this day, some of my fondest fishing memories include fishing with my son when he was six years old (he is now is 31 years old), my father, brothers, brothers-in-laws, nieces, nephews, friends and, of course, my wife. Everyone who catches a fish is happy. I have an office filled with photographs of people (young and old) who have caught fish on my boat and every one of them has a smile on their face. It feeds our sense of self worth to fish. It makes us feel successful and gives us a sense of accomplishment. A sense of accomplishment and enhanced self image is particularly important for young people. 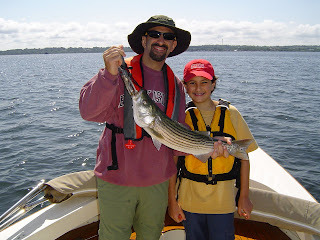 That is why today, I signed up as a volunteer for the Rhode Island Saltwater Anglers Association’s (RISAA) 12th Annual “Take-A-Kid Fishing Day”, Saturday, June 20, 2009 from 9 to 11:30 a.m. at Brewers Greenwich Bay Marina in Warwick on Masthead Drive. Children are treated to a morning of fishing on the Bay followed by a cookout. 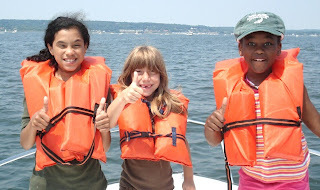 Last year over 250 children, 59 member boats and 200 volunteers participated. 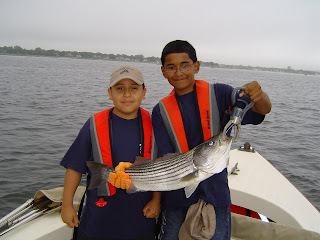 The purpose of the event is to give seven to thirteen year old children a chance to learn about Narragansett Bay and the environment, experience the thrill of catching a fish, ride on a boat in saltwater and a chance to start building a lifetime of fishing memories. For many children it is the first time they have ever been on a boat. RISAA is looking for volunteers to help with logistics and cook as well as RISAA members that have boats to offer. 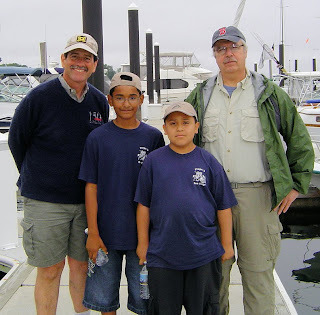 Steve Medeiros, president of RISAA, said, “It is always a balance between the number of children and available boats. So, children generally participate through partner organizations such as the Boys and Girls Club, Scouting, neighborhood groups and recreation departments. We are looking for potential partner organizations for next year’s event so please call if your organization is interested in the Take-A-Kid Fishing event.” For more information visit http://www.risaa.org/ or call 826-2121. Freshwater fishing is heating up as the bass are hitting all over the place, said Craig Mancini of Continental Bait & Tackle in Cranston. Three to four pound fish have been hauled in at Stump Pond in Smithfield. Mancini said in the Cranston area, “Angel’s, Blackamore and Meshanicut were all reporting good size fish.” Trout have been restocked for the holiday weekend according to Dave Henault of Ocean State Tackle, Bristol/Coventry/Providence. He related Johnson’s Pond and Stump Pond have been offering nice bass as well as pike. Striped bass fishing on the Bay is good. Lenny Lake reported he and his friend caught several fish (including a 35” striper) this weekend fly-fishing in about 12 feet of water close to shore north of Conimicut Point between the base of Conimicut Point and Gaspee Point. The fish were feeding about two to three feet below the surface. Peter Magnan of Cranston went striper fishing for the first time on my boat this weekend and caught two fish, a 31” and a 32” striper off Bear Point, Prudence Island. Sunday I caught several good size school bass with surface lures in Greenwich Bay off Buttonwoods. Surfcasters in South County are finding bass with top water plugs and shallow divers at Narrow River, Deep Hole and Watch Hill said Dave Henault of Ocean State Tackle. The menhaden are up the Pawcatuck River and keeper bass are being landed live lining and chucking with the menhaden. Fishing off Block Island is heating up too, fish caught on North Rip and between the Island and Southwest Ledge according to Ken Ferrara, Jr. of Ray’s Bait & Tackle in Warwick (fish being caught with umbrella rigs and parachute jigs). Angler Mike Shepard of Newport said fishing around Aquidneck Island has been on one day and off the next. Squid seem to be on and off too. However, some fish are starting to appear along the ocean fronts. Blue fish and scup are in. Several reports of tube and worm anglers landing four to five pound blue fish and they are also bringing up scup reports Ken Ferrara, Jr. of Ray’s Bait & Tackle. The recreational season for scup (shore and private) starts May 24. Minimum size is 10 ½” and the possession limit is ten fish/person/day. 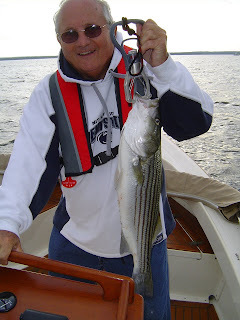 Captain Dave Monti has been fishing and shell fishing on Narragansett Bay for over 40 years. He holds a captain’s master license. Your fishing photos with captions, stories, comments and questions are welcome… there’s more than one way to catch a fish so e-mail Captain Dave at dmontifish@verizon.net . It’s not always about the fish… this weekend I enjoyed fishing with Peter Magnan of Cranston (my brother-in-law). Pete landed this 32” striped bass off Bear Point, Prudence Island. This was his first striped bass and a great experience. Children fish on Greenwich Bay during RISAA’s 2008 Take-A-Kid Fishing event. Often it is the first time the children have been on a boat. Trolling with tube and worm for striped bass has been very productive for me over the years. It is a more passive than active tactic compared to site fishing and casting. However, the method allows you to cover a lot of ground when fish are on the move, below the surface and can put your bait exactly where the fish are in the water column. The reward for your patience? You catch bigger striped bass. Here are a few tube and worm trolling tips that will enhance your catch. What is a tube and worm rig? A tube and worm rig consists of a colored rubber tube with wire running through it. At one end it has a weight and a swivel that attaches to your line and a hook (or two) on the other end. A live or artificial worm is placed on the hook. What type of line is used? Fishing with tube and worm generally involves trolling with lead core line (wrapped with braided nylon) or wire line so the tube sinks to a desired level depending on how deep the water is and where the fish are. Generally you want the tube close to the bottom where the big bass are. Lead line is generally used in the Bay for depths of eight to twenty-five feet and wire generally in the ocean for depths greater than twenty-five feet. The line is marked or coded so the angler knows how much to put out for the depth of the water. For example each thirty feet of lead line is a different color and gets you down five feet. However, I have found this to vary widely depending on the current, weight of the tube and boat speed (when trolling for bass in the Bay I like to troll at 1.5 to 2 knots). Different types of rigs. Tubes come in all sizes and colors. I have had great luck with red tubes in Narragansett Bay, but amber tubes seem to work best in the ocean in deeper water. I keep a few colors on board… black, orange, purple, red, amber, etc. and rig two different colors and see which color the fish seem to bite. Then switch the rigs to the color that is working. Knot your tubes. This is important… tubes are supposed to curl and twist like a cork screw as they go through the water. The twisting helps call attention to the bait and they say the bass see it as an eel or large worm going through the water. So buy tubes that are rigid enough to hold a twist. Many anglers knot tubes in storage so they are not flat when they are pulled through the water. Where to troll. Troll close to shore where bait can get trapped by bass and any place that has good structure on the bottom… rocks, ledge, debris, near bridge pilings, holes and at the edge of current flows. Large bass hold up behind rocks and pilings, in holes and outside of current flow waiting for bait to swim by and then move to take the bait. The ideal place to troll is along a rocky coastline close to shore. Lobster pots are often placed on the edge of a drop off. So although they can create accidental hook ups, tolling near lobster pots is usually a good bet… you’re on a ledge and there is bait in the pot which acts like chum. Single hook good for catch and release, but keep the pressure on. Striped bass taken on tube and worm are generally hooked on the lip (no gut hooks) with a single hook. The hook is easy to remove and causes minimal trauma to the fish. However, the single hook in the lip can easily be shaken loose by the bass, so it is important to keep pressure on the fish. Fighting and boating your catch. When fighting fish it is important that the master of the vessel keep the boat moving forward at slow speed and the angler keep pressure on the fish keeping the pole high. Vessel movement is often achieved by putting the boat in and out of gear so it creates slow forward movement. Once the fish is close to the boat try to bring it to the side of the boat so it can now be removed from the water by hand or gaff without shaking loose the hook. These tactics are difficult to do if the angler is alone. Safety should be your top priority, so you may only be able to use some of these tactics when alone. Fresh Water. Harold Hemberger reported catching three nice pike (the largest six pounds) and one bass on Waterman Lake last Sunday at sunrise with shiners. Melonie Carr and her partner Joe caught five trout, two at Carbuncle Pond in Coventry and three on Wood River. I met Julies Mitchell of Warwick on his way out for a day of bass fishing on Indian Lake. He related he has caught a lot of great bass in Warwick, close to his home, at places like Arnold Pond. Dave Henault of Ocean State Tackle in Providence/Coventry/Bristol reported that Dave Pickering caught a 22 lb. carp and Devon White (seven years old) caught a 17 and an 18lb carp at Lake Tiogue in Coventry. Fresh water fishing has been consistent but few have caught their daily limit. Striped Bass. The striped bass bite seemed to slow as the water cooled last week (dropped two degrees by Friday) and fish in the lower part of the Bay were finicky. Mike Shepard from Newport reported that the bite on and around Aquidneck Island slowed. However, striped bass were being caught in the upper Bay as the water warmed up again Saturday. Anglers caught striped bass using a variety of baits. Ken Ferrara of Ray’s Bait & Tackle in Warwick reported anglers taking fish all over Greenwich Bay… Sally Rock, Warwick Light, Sandy Point, etc. A lot of fish, school bass as well as keepers up to 36”, taken on medium sized storm shad. Early in the week I caught six fish using surface and swimming plugs and at the end of the week landed five fish using tube and worm including a 30” keeper on Greenwich Bay. Tautog bite was strong in Bristol Harbor this week with Captain Billy Silvia reporting several seven to eight pound fish taken. No fish reported taken at Ohio Ledge Saturday with an incoming tide. However, Ken Ferrara from Ray’s Bait & Tackle reported anglers landing good sized tautog (8 lbs.) at Spindle Rock and Ohio Ledge on Monday with the outgoing tide. Fluke. This week the RI Department of Environmental Management establish a 21” summer flounder minimum size, with a season that runs from June 17 to December 31 and a possession limit of six fish per person per day. So far other 2009 Recreational Marine Fisheries regulations have stayed the same. I love to shellfish and cook what I catch… shellfish for steamers (soft shelled clams), scallops and Rhode Island’s beloved quahog. What’s not to like. You get to be outdoors, participate in a hunt, spend time in the water and experience that wonderful feeling of bringing home the bacon (or the quahogs) to feed family and friends. 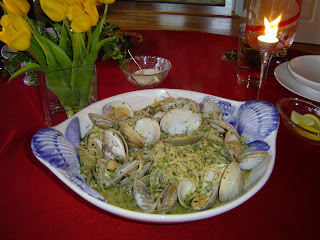 Here’s my favorite way to catch quahogs then cook a gourmet pasta dinner. If you can’t dig the quahogs you can buy them at the docks or at a fish market that has fresh shellfish. The word quahog comes for the Narragansett Indian name “poquauhock”. Indians used quahog shells to make beads that were used as money (called wampum). A quahog can get quite old, each line on its shell is a growth ring. You can count the rings to determine the quahog’s age. Researchers estimate that the largest quahogs (about four inches in length) can be 40 years old (see the Quahog Fact Sheet by Eleanor Ely at http://seagrant.gso.uri.edu/ ). You can dig for quahogs in many coastal Rhode Island towns. Parts of the Bay have seasonal or permanent closures, check the RI Department of Environmental Management Web site at http://www.dem.ri.gov/ and/or call them for current closure information. I like to fish spots I know are clean in Warwick , North Kingstown and on Salt Pond in Narragansett. For years, I dug for quahogs with my feet, this is the way may father taught me. Sort of like doing the twist with your feet underwater and moving backwards until you feel a quahog. Once you do, you reach down and pull it up with your hand. Today I use a quahog or clam rake which is available at bait and tackle shops and hardware stores. 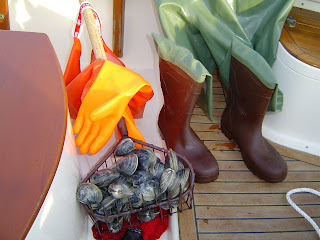 In early spring the water is about fifty degrees so I use waders and rubber gloves with great success (I use this same gear to scallop in the fall and winter). They protect my feet and enable me to quickly catch what I need for dinner, minimizing the time I am in the cold water. You can clean quahogs in the salt water by tossing them underwater in a mesh nylon bag. When I get home I spray them with water to get the remaining mud off and discard any with opened or cracked shells. I then soak them for an hour or so, drain and refrigerate them. Quahogs of all sizes open easier when their muscles are cold and relaxed. So I try to refrigerate them at least a couple of hours before opening them. I have kept them in the refrigerator for three to four days. The RI Sea Grant Web site quahog fact sheet referenced above relates quahogs “can keep up to a week in the refrigerator if they are unopened and laid on their sides”. Scrub littleneck quahog shells thoroughly and put them aside. Cook linguine while making recipe. Fresh water fishing locally for largemouth bass is still good said Craig Mancini of Continental Bait & Tackle of Cranston, however, customers not happy about trout fishing. Striped bass are biting everywhere and on a lot of different baits. The water being three degrees warmer has made a big difference. Ken Ferrara at Ray’s Bait &Tackle in Warwick said customers are taking school striped bass some with clams on the bottom. Fish caught at Pine Hill Ledge, Chepiwanoxet and Warwick Light. Sunday afternoon I caught five fish (including a keeper) off Buttonwoods using a large surface plug that mimics a wounded herring or menhaden. Dave Henault of Ocean State related Nils Christiansen of Ultimate Kayak Fishing took three keepers on sandworms off the shores of Prudence Island. Angler Mike Shepard of Newport reports the striped bass have arrived on the beaches and along Ocean Drive, no tiny ones, all good size and in good shape for this time of year. He caught them on small jigs, plugs and swimming shads. Tautog bite was good this week too. Dave Henault said a customer caught a 23” tautog in the Taunton River and that Captain Bill Silvia found keepers for his customers on his first Tautog trip on Mt. Hope Bay. Ken at Ray’s Bait & Tackle related that four and five pound fish were not uncommon this week. Customers taking fish at Conimicut Light, Spindle Rock, Ohio Ledge and Rumstick Point. Squid is in according to Craig Mancini from Continental. Squid jigs moving off the shelves. Ocean State Tackle employees report they nailed the squid at Goat Island this past week. The spring tug of war season with Tautog began April 15. The best fishing for the species is in the late summer and fall but fish are caught in the spring too. Tautog (or Blackfish) are a great eating fish. They are work to catch due to the maneuvering, bottom tie-ups and lost rigs that are caused as part of the process. However, their bulldog like fight is very exciting, much like a tug of war between you and the Tautog. Once the fish is hooked it will try to bulldog its way back down into rock or structure where it can cut the line or catch the sinker on a rock. So when the fish bites, it becomes the angler’s job not to let it bury itself in the structure. The good thing about Tautog is that they can be fished from shore or boat. The common thread is structure. From shore it is a matter of trial and error to find a hole that holds fish. Cast too close to shore and you can easily get hung up on rock. Cast too far and your line may not be close enough to feel the bite. From a boat it is important to position the vessel over structure. Locate the structure (on sonar if you have it), estimate wind and current, then anchor up current so that as the anchor line pays out the vessel is over the structure or slightly before it. Tautog are territorial so it is important to fish all sides of the boat, even cast a bit covering as much area as you can. If still no bites, pay out a little more anchor line to reposition the boat, repeat the process, if still no bites it is time to move to another spot. Tautog rigs should be kept simple, one or two hooks and a sinker. I use clam worms and live green crabs for bait. Softer baits, like clam worms are used in spring. When using crabs, break off claws and legs, cut the crab in half or use the entire crab if small. Hook the crab though one leg socket and out another. Loosing rigs is a common Tautog fishing experience. To reduce rig loss consider tying the sinker on with 8 or 10 lb. test line or an elastic so if the sinker gets hung-up, the lighter line or elastic breaks first and all you loose is the sinker. Usually Tautog will hit the bait with a tap, tap. My friend Captain George Cioe believes that Tautog is positioning the bait for consumption with the taps. So it is important to have no slack in the line so you feel the taps. To set the hook lower your rod as the fish pulls. Raise the rod up firmly feeling the weight of the fish (no need to jerk the rod up hard). Once the fish is hooked, keep the rod up and pressure on so the fish is not able to run for cover. It is important to put little drag on the reel and apply constant pressure so the Tautog comes up and does not go down. For this reason consider using braid rather than monofilament line that may stretch and cause the fish to reach structure and cut the line or snag the sinker. From shore the rocky coastline on Jamestown (Beavertail) and Newport is good, around light houses is good too as are old bridge pilings and underwater debris. From a boat I have had good luck at Whale Rock, the Jamestown lighthouse next to the bridge and rock structure around Hope Island. Tautog also live in uncommon locations, anywhere there is debris, rock clusters, wrecks, etc. My luck has been best early in the day or late in the afternoon when there has been water moving. The Tautog season runs from April 15 to May 31 with a closure occurring June 1 through June 30. The season opens again July 1 and runs until December 15. Minimum size is 16”. The possession limit from April 15 to May 31 and July 1 to October 16 is three fish/person/day. The limit is eight fish/person/day from October 17 to December 15. Fresh water action was good this week. Anglers are catching fish but not their limit. Rattanna Phommabouth caught a nice Pike on Warden’s Pond casting with a Mepps Aglia from Ocean State Tackle, Craig Mancini of Continental Bait & Tackle in Cranston said that Cub Scout Pack 6 of Cranston had a good day of fishing on Meshanicut Pond, Scouts and adults did well with shiners. Artie Peltier of Erickson’s Bait & Tackele said most customers are doing better fishing ponds rather than rivers. Tautog. Captain Billy Silvia caught six fish and two keepers in Bristol Harbor using crab. Ken Ferrara of Ray’s Bait & Tackle in Warwick reported a customer taking a fish at Spindle Rock. I fished for Tautog with my brother-in-law Pete this weekend at the Jamestown bridge lighthouse and around Hope Island with no luck. Fish this time of year are staging for spawning so I will try again as the season progresses. Striped Bass. Not a lot of bass reported yet. Angler Jim Malachowski fished the Providence River from Bold Point (including inside the hurricane barrier) to Save the Bay and got no bites. Angler Mike Shepard of Newport reported no squid and no striped bass in the area (and both usually arrive together). The bass are south and will be here soon. Dave Henault of Ocean State reported Bob Oberg caught 18 stripers (two keepers) from his kayak (with tube and worm) on the Thames River in Connecticut. Fluke/Flounder. At press time DEM’s Fish & Wildlife Division was scheduled to have a public hearing on proposed recreational and commercial fishing regulation changes on Wednesday, April 22, 6 p.m. at the URI Bay Campus. Proposed summer flounder regulations were on the agenda. My wife laughs when I say “big fish are caught in the winter”. The saying has its roots in a football quote form Vince Lombardi (I think? )… something like… football games are not won in the fall or winter but in the off season when all the preparation occurs. I guess my wife is amused at how excited I get over the sport. But it is true, you have to prepare in advance to catch big fish, in the winter or early spring. Who wants to loose a big fish due to faulty tackle? Not me... I have leaned my lesson… lost too many fish this way in the past. So, if you haven’t already done so, get your gear in order now so when the bite is on you are fishing your tackle box with confidence. The last thing you want to do is reach for your tackle and not have the proper bait, rod or reel available in good working order. Each year I replace most line that has been used. This is a judgment call as to what is meant by “used”. For example I have a couple of reels spooled with 40 lb. test monofilament line for fishing live bait (Menhaden for stripers). I used them three or four times last year. So I checked the line, it looked good… no nicks, snags or apparent stress so I did not change it. However, I changed just about every other rig I own with new monofilament, braid, lead or wire. Spool tight enough and then stretch the line… maybe the first 100 feet (of monofilament line) to relax its memory to avoid those nasty bird’s nest tangles. Give your reels a good cleaning, particularly when the line is off. Grease where directed by manufacturer, often times where to do this is marked right on the reel or with the instructions that came with the reel. If you’re like me the instructions are long gone so do not hesitate to stop by your local bait or tackle shop to ask where to grease. Do not be afraid to ask questions, that is what they are there for, and they want your business. By the way, do not grease the drag it is not meant to be greased, if you do it will not work. Examine the rods for cracks and stress marks. Closely examine the eyes for chips or cuts that could cause line to snag, rub or break. By the way, do not place hooks on the eyes or they will eventually create cracks that will cut line as it passes through. Here’s how I approach my tackle. I think about getting tackle ready in chronological order when certain species are fished… starting with winter… tautog, striped bass, blue fish, fluke, tuna, etc. I then go through all by tautog rigs first, then the striped bass, etc. I make sure I have enough rigs to fish the species. All hooks are clean and sharp (no rust), and strong enough for the size fish I am going after. Often hooks that come with lures are not strong/quality hooks. For example I use surface plugs and swimmers for striped bass (and blue fish) in the spring and early summer so I have replaced all lure hooks with treble hooks that are 4 times stronger to make sure they will hold bigger, stronger fish. Use wire leaders for blue fish and monofilament or fluorocarbon for striped bass. Blues won’t bite though the wire and stripped bass will find it harder to see the monofilament or fluorocarbon leaders. Make sure lures have no nicks or stress marks from fish pulling. If they do, replace them. This year I plan to switch most of my leader hooks to circle hooks to safely catch and release undersized or unwanted fish (particularly stripped bass). 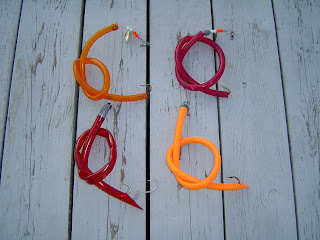 Circle hooks are designed to hook the fish at the corner of the mouth and not down in the belly. Opening Day/Weekend. In spite of bad weather and a holiday weekend opening day/weekend was OK. Most anglers caught fish, maybe not their limit, but they caught fish. Good reports from Silver Spring in North Kingstown, Carbuncle Pond in Coventry and Ken Ferrara Jr.’s dad related he caught two nice fish at J.L. Curran Reservoir in Cranston. Don at John’s Bait & Tackle related they already had several entries to their in-house trout contest. Angler Melanie Carr and her partner Joe fished several ponds and caught two fish at Barber Pond in South Kingstown. Craig Mancini of Continental Bait & Tackle in Cranston said that by 11 a.m. Saturday a customer had called to relate that trout would be on the dinner table Saturday night. Tautog. Spring season opens their week, April 15. Some good sized fish have been reported in traps and lobster pots. So all seem cautiously optimistic. We will know by week’s end. Striped Bass. Gary Leatherberry of Ericson’s Bait & Tackle related the Herring were in Little Gordon Pond next to the shop (good sign). Ken Ferrara reported school bass were caught in East Greenwich Cove (bait reported to be seen in cove, but when I fished it last week I had no luck, but things can change quickly). Seals spotted in Greenwich Bay last week (they fish better than we do, hope they leave soon). Dave Henault of Ocean State Tackle (Bristol/Coventry/Providence) reported school bass taken in Sothern Rhode Island at mouth of rivers and near power plant in Providence. Do not hesitate to forward electronic photos of fish you caught with a brief caption description of the fish, trip and who is in the photo. Send images to Caption Dave at dmontifish@verizon.net .Visit our Web site to view the images as we get the on-line version of the No Fluke column rolling. Caption Dave Monti has been fishing and shell fishing on Narragansett Bay for over 40 years. He holds a captain’s master license. Your fishing stories, comments and questions are welcome… there’s more than one way to catch a fish so e-mail Captain Dave at ­­­dmontifish@verizon.net . If you like to fish or are like me and always want to know more about fishing, you will enjoy reading No Fluke, a new fishing column by me, Captain Dave Monti. No Fluke will alert you to where the bite is hot by checking in with area fishing guides, charter captains, bait and tackle shop owners and my own personal fishing log. No Fluke will offer a range of information and links for exactly what you want or need to know to catch fish, what gear to buy, how to get to the bite and access to check on local tide and weather conditions. The column will offer readers fist hand experience and knowledge on how to catch a variety of species… fluke, tautog, striped bass, blue fish, scup and shell fish. Fishing news in regard to catch limits, State/Federal law, sport fishing advocacy, catch and release as well as environmental topics will be covered. And, every now and then a fast and easy recipe for cooking fish. Caption Dave has been fishing and shell fishing on Narragansett Bay for over 40 years. For fifteen years he held a scallop license on Nantucket where he fished in the winter months. He holds a captain’s master license and a charter fishing license. Read No Fluke and keep your eyes open for Captain Dave, you might catch him fishing on Narragansett Bay or near ocean coastal waters on his center console boat, Angell Light. There’s more than one way to catch a fish so visit Captain Dave’s website at http://www.noflukefishing.com/ and e-mail him your fishing news, photos and captions, comments, questions and thoughts at dmontifish@verizon.net .